Some 16 years after 3D Realms’ controversial original saw limbs lopped off, Flying Wild Hog and Devolver Digital have joined forces for the reimagining of Shadow Warrior. Lo Wang (chuckle) is arguably a man who has stood the test of time better than 3D Realms’ other infamous creation Duke Nukem. While the game is just as big, brash and gruesome, everything here seems to work just a little bit better. Shadow Warrior is carnage at its very best, an enjoyable excuse to chop heads off foes and slaughter innocent wildlife just for the sake of it. Anyone who’s seen the teaser trailer would have gathered that a wry sense of humour runs throughout the game. It certainly doesn’t take itself too seriously and the lewdness and other qualities which saw it fall foul of some observers many years ago has been toned down somewhat. Any game trailer boasting “excessive fireworks”, “fully destructible bicycles”, “product placement” and “stylish nostalgia” gets the thumbs up from me. "Right from the outset with the prologue, you’re given an indication as to the bloody carnage that follows. Onscreen prompts outline the basic controls and inform you how to slice and dice your adversaries with your katana." What you have here is an elegant-looking first person shooter, a hack and slash effort that sees a lone warrior in pursuit of a legendary blade known as the Nobitsura Kage that bestows unimaginable powers to the holder. What’s more, our protagonist Mr Wang has to face a horde of hellish beasts in the process. Right from the outset with the prologue, you’re given an indication as to the bloody carnage that follows. Onscreen prompts outline the basic controls and inform you how to slice and dice your adversaries with your katana. The swordplay is hugely satisfying – with a single sweeping motion of your blade sufficient to split an enemy in two. Within minutes, as limbs go flying and heads roll, you’re hooked. The plot sees our hero and his trusty demonic sidekick Hoji – a comedic and slightly irritating spirit – on a quest for the fabled sword, while eradicating bad guys in the most gruesome ways imaginable using a combination of blade, bullets and magic. "The controls get increasingly complex the more you play, with the aforementioned skill upgrades requiring a new button combination to be learnt." They say variety is the spice of life and more inventive attacks earn you bonus style points a little like the Skill Kills in 2011’s Bulletstorm. Karma, cash and crystals mean skills can be upgraded, with some awesome firepower and abilities available as you get further into the game. Alongside the myriad shotguns, shurikens and rocket launchers, magic plays an important role too – helping to boost health or vanquish enemies. Between skirmishes with evil doers, it’s certainly worth exploring as there are plenty of areas to uncover and secrets to find. You’ll also discover stashes of money and ammo clips to pick up, all of which enable you to get your hands on bigger and better guns to unleash merry hell. The controls get increasingly complex the more you play, with the aforementioned skill upgrades requiring a new button combination to be learnt. Not only do you need to remember which direction key to double click before hitting the left mouse button to pull off special moves, but there are countless other controls to master including simple tasks like running, operating your flashlight or using items. The numerous keyboard controls certainly give your fingers a workout, especially in the heat of battle. 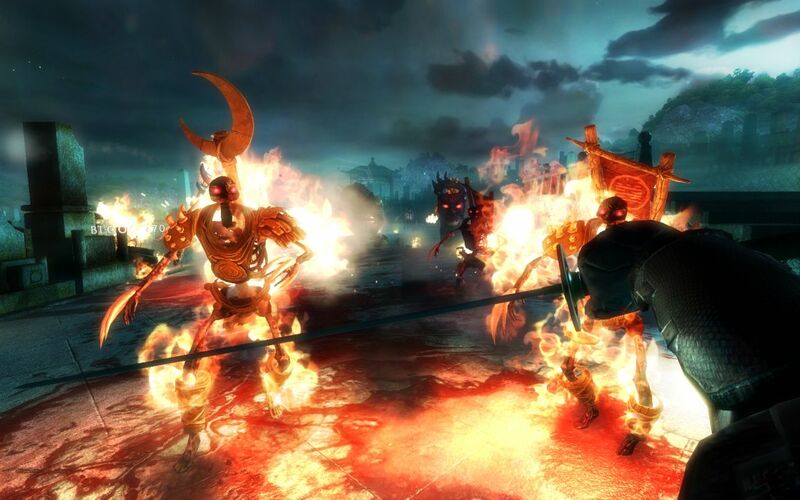 "Shadow Warrior is hugely entertaining, its bloodthirsty gameplay proving to be a guilty pleasure." When not avoiding a horde of incoming demons, you could do worse than spend a little time gawping at the nicely-detailed scenery. The backgrounds and graphics are decent, ranging from beautifully delicate tree blossom and babbling brooks to blood splatters and horny rabbits. It’s all very fast and smooth, and the oriental sounds and satisfying thwack of sword on sword – or head – really add to the atmosphere. There’s no better feeling than that giant sweeping motion where you rotate on the spot, and swing your blade to part enemies from their limbs. But fun though it is, you can’t get around the fact that the majority of the game involves killing, walking about and unlocking doors to access more areas full of increasingly irate enemies and massive bosses. It can get a little repetitive and before long you may well opt to skip all those cut scenes to get back into the action. For all the carnage that the guns provide, it’s the trusty katana that truly steals the show. 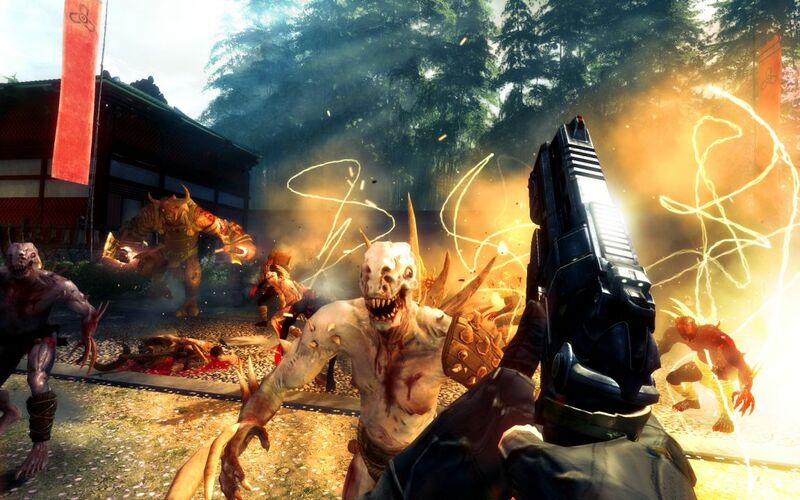 Shadow Warrior is hugely entertaining, its bloodthirsty gameplay proving to be a guilty pleasure. 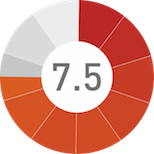 The wealth of upgrades available also mean that subsequent playthroughs could feel completely different, adding longevity. FPS fans definitely need to unleash their inner Wang. Looks good running on a decent PC. Doesn’t take itself too seriously and has humour running throughout. Simple gameplay and limited replayability. Lacking a multiplayer option. Gratuitous. Violent. Insane. Bloody. 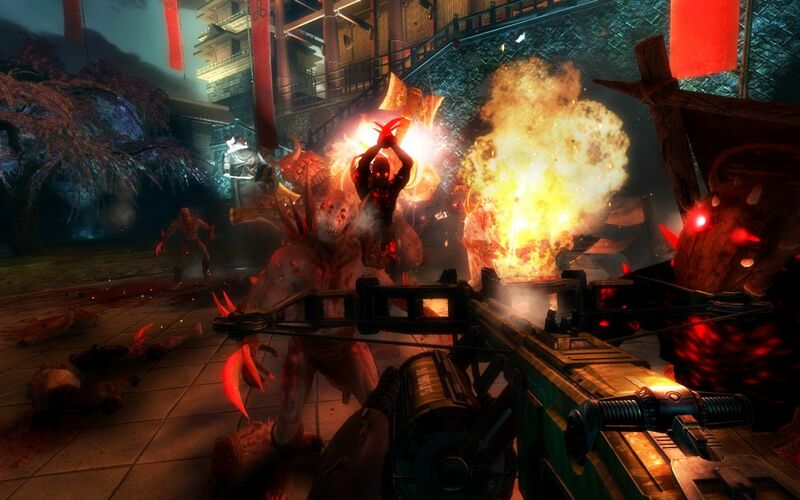 Four words that perfectly sum up Shadow Warrior, a nod to the 1990s classic.